Is the Medical-Pharmaceutical-Regulatory Cartel Assassinating Physicians? Over the past several weeks no less than seven established doctors have either been killed or died under unusual circumstances (e.g. here and here). 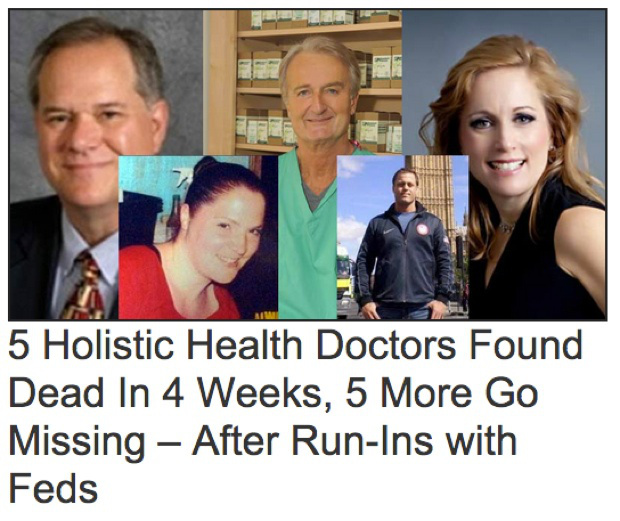 What do these physicians have in common and what remedies are they researching or advocating? Do any of their proposed treatments pose a threat to the multi-billion dollar pharmaceutical cartel? If so, would government agencies and/or private contractors be commissioned to harass and perhaps even assassinate such individuals? The answer may lie in an understanding of nagalese, a protein made by cancer cells and viruses. Nagalese is a primary cause of immunodeficiency given its ability to block the body’s production of GcMAF, otherwise known as “Vitamin D binding microphage activating factor,” a naturally-produced immune regulating compound that aids in fighting what are traditionally considered terminal diseases. Some researchers suggest that nagalese is one of many toxic components found in the immunizations commonly administered to children, including the Measles-Mumps-Rubella vaccine.